Dora The Explorer is ringing in the Holidays with her fun CD, Dora’s Christmas. This holly, jolly CD features Christmas Classics like “Deck the Halls”, “Jingle Bells”, and “Feliz Navidad”. Also included on this snowy sensation are Bonus Tracks from Dora’s Holiday Movie Dora’s Christmas Carol Adventure. You’ll want to make sure Swiper doesn’t swipe this CD! Along with fun tunes on this Sony Label album, kids will enjoy the great bonus content also on this disk. Bring fun wall papers, lyrics, and a Dora’s Christmas Carol mini video to life using a computer CD drive. This CD’s insert features the usual song information, but also includes a festive Feliz Navidad/Christmas game board and pieces. For those of you not wanting to cut your insert please note there is a great printable version in the Bonus Content. For those of you looking for the more traditional versions of well-known Christmas songs, you’ll have to look elsewhere. When I first listened to the CD with my daughter, I was expecting the songs to be the original version but of course sung by Dora. “Here comes Santa Claus, Aquí viene Santa Claus, To visit me and my friends, Everyone’s waitin’, anticipatin’, As his sleigh comes round the bend. Bells are ringin’, Boots is singin’, All is merry and bright. So hang your stockings on Nochebuena, ‘Cause Santa Claus comes tonight.” I’d expect nothing less from this Hispanic sweetheart. If your child is a Nickelodeon fan they will adore this exciting CD not only because it features voices from Dora the Explorer, but also friends from The Backyardigans, and Go, Diego, Go! Kids will recognize the “Dora The Explorer Christmas Theme” which is a jingle bell filled version of the original Dora Theme song. Parents will love that it features the Young People’s Chorus of New York City. After I got over my initial shock of the “Dora-fied” words, my daughter and I were dancing around the living room enjoying the upbeat song, “Rockin’ Around the Christmas Tree”. So if you’re like me you may want to listen to the album once through, sample it online, and once you buy it just have fun with your kids. 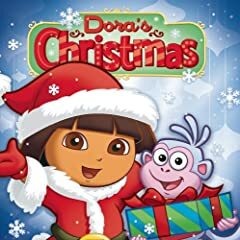 Dora’s Christmas is a really fun CD for kids who love Dora the Explorer to be able to enjoy Christmas with singing, and silliness. Introducing Yo Gabba Gabba: Music is…AWESOME! Volume 2. Yo Gabba Gabba’s 2010 release and second volume of fun tracks rock my socks off! We love Yo Gabba Gabba, one of the top children’s television shows on Nick Jr. Yo Gabba Gabba:Music is…AWESOME! Volume 2. really is awesome for so many reasons including great artists, songs with lessons, and most importantly, they’re fun to dance to. I know I’m old when I start saying, “I just don’t get what things kids are into these days.” From music, to clothing styles, I just don’t understand. Anni Zola is no exception to my aged misunderstandings. She is sweeping the nation and I have never heard of her until now! What or who is Anni Zola you may be asking, unless you are or have a teenager, you may be as confused as I was when I first started listening to her musical audiobook titled My Story. Even though I don’t quite understand something doesn’t mean it’s a bad thing though.